The Battle of the Ch’ongch’on River, also known as the Battle of the Ch’ongch’on or the Second Phase Campaign Western Sector (Chinese: 第二次战役西线; pinyin: Dì Èr Cì Zhàn Yì Xī Xiàn), was a decisive battle in the Korean War, and it took place from November 25 to December 2, 1950, along the Ch’ongch’on River Valley in the northwestern part of North Korea. In response to the successful Chinese First Phase Campaign against the United Nations forces, General Douglas MacArthur launched the Home-by-Christmas Offensive to evict the Chinese forces from Korea and to end the war. Anticipating this reaction, the Chinese People’s Volunteer Army Commander Peng Dehuai planned a counteroffensive, dubbed the “Second Phase Campaign”, against the advancing UN forces. 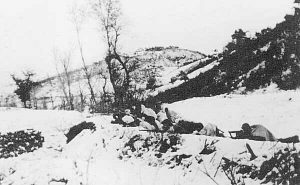 Hoping to repeat the success of the earlier First Phase Campaign, the Chinese 13th Army[nb 4] first launched a series of surprise attacks along the Ch’ongch’on River Valley on the night of November 25, 1950, effectively destroying the Eighth United States Army’s right flank while allowing Chinese forces to move rapidly into UN rear areas. In the subsequent battles and withdrawals during the period of November 26 to December 2, 1950, although the US Eighth Army managed to avoid being surrounded by Chinese forces, the Chinese 13th Army were still able to inflict heavy losses onto the retreating UN forces which had lost all cohesion. 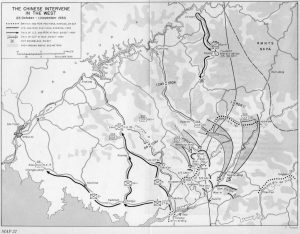 In the aftermath of the battle, the US Eighth Army’s heavy losses forced all UN forces to evacuate North Korea and to withdraw to the 38th parallel. 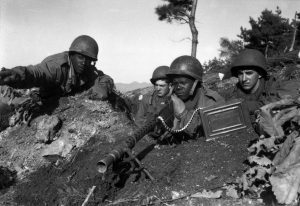 In the wake of the United Nations (UN) forces’ successful landing at Inchon and the subsequent destruction of the Korean People’s Army (KPA) by mid-1950, the Eighth United States Army crossed the 38th parallel and advanced rapidly towards the Sino-Korean border. Alarmed by this development, China’s Chairman Mao Zedong ordered the Chinese People’s Volunteer Army (PVA) to intervene in Korea and to launch the First Phase Campaign against the UN forces. 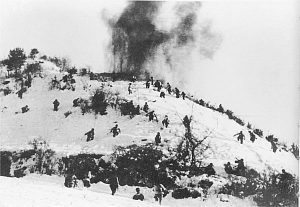 Between October 25 and November 4, 1950, the PVA 13th Army surprised and defeated the Republic of Korea (ROK) II Corps and the US 1st Cavalry Division in a series of battles around Onjong and Unsan, destroying the right flank of the US Eighth Army while forcing the UN forces to retreat back to the Ch’ongch’on River. Although Chinese forces were able to break through the UN line, logistics difficulties forced the Chinese to withdraw on November 5, 1950. Despite the success of the Chinese First Phase Campaign, the UN planners still believed that China had not intervened in Korea on a large scale. The suddenness of the Chinese withdrawal in the face of a victory further reinforced this belief. Working on the assumption that only 30,000 Chinese troops could remain hidden in the hills, General Douglas MacArthur ordered the bombing of the bridges over the Yalu River in an effort to cut off Chinese reinforcements. Confident that the UN air force could detect and disrupt any troop movements across the Yalu River, MacArthur launched the Home-by-Christmas Offensive on November 24 to rout the remaining Chinese and North Korean forces and to end the Korean War. Unknown to the UN planners, however, there were already 180,000 Chinese troops stationed in Korea, with more reinforcements infiltrating across the border. Although the PVA was ordered to maintain a defensive posture in North Korea until Soviet weapons could arrive in the spring of 1951, its earlier successes convinced the Chinese leadership that the PVA was capable of turning the tide of UN advance. Encouraged by the fact that the UN did not know their true numbers, PVA Commander Peng Dehuai outlined the Second Phase Campaign, a counteroffensive aimed at pushing the UN forces back to a line halfway between Ch’ongch’on River and Pyongyang. As a part of a deception plan to further reinforce the weak appearance of Chinese forces, Peng ordered all units to rapidly retreat north while releasing POWs along the way. 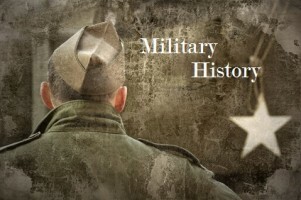 With 230,000 troops at his disposal and another 150,000 heading to the Chosin Reservoir, Peng authorized the start of the Second Phase Campaign on November 22, 1950. This entry was posted in Military History and tagged AMVETS, post, 79, post 79, veterans, service members, community, AMVETS Post 79, Ladies, Auxiliary, Ladies Auxiliary, sons of amvets, sons, amvet, bremer, bremer county, Iowa, Iowa AMVETS Post 79, Waverly Iowa, AMVETS Club, waverly amvets, waverly vets, waverly veterans, waverly amvets post 79, waverly area veterans, WAVP, AMVETS Auxiliary, Waverly Area Veterans Post, amvets post, service, waverly ia, Waverly Area on November 1, 2016 by NuggetWeb Support.